Are you tired of how messy your shoe closet is? Do you waste a lot of time hunting for shoes before going out? Do your boots take up a lot of space? Not to worry, an excellent storage solution can get rid of your problems. Usually, people store their shoes, boots, and umbrellas in a hallway closet or mudroom accessible to the front door. However, few have a dedicated mudroom for storage. Others have such a small entryway that there is no room left for a shoe cabinet. 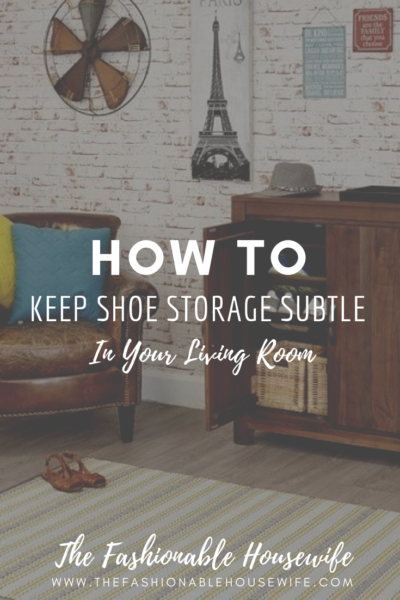 If you find yourself in need of storing shoes in your living room because there really is no other place to store them, here are a couple of tips to store shoes out of sight in the living room. 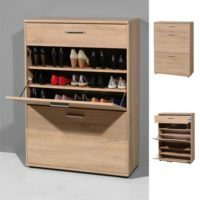 Furniture in Fashion has rotating shoe storage cabinets. Shoes can be piled in the tiered compartments inside and then the cabinet can be rotated to conceal them. These are fitted with the wall and may come with a high gloss or reflective surface. The cabinet shelves can be adjusted accordingly to store shoe polishes, cleaners and brushes in one place as well. The best part is that your guests will never notice that the reflective surface conceals a nifty shoe storage cabinet underneath. 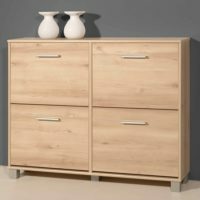 These shoe storage cabinets may have two to four doors. They are available in high gloss surface which can add a classy element to your living room. The doors have elegant steel handles attached and inside, as many as thirty pairs of shoes can be stored. The plus point with this storage unit is that it doubles as a console table. Fresh flowers can be stored in clear glass vases on top. A pair of bookends can be used to keep coffee table books on the shelf as well. 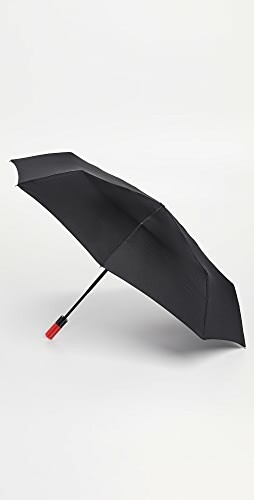 Thus, it has a double utility. No one needs to know you’re hiding shoes in there! Do you ever open your shoe cabinet only to have all the contents dropping to the floor? Well, it would never happen with cabinets with flap doors. They usually have two bottom units with flap doors and a top drawer with metal runners or all three flap doors. If you have kids over, then they wouldn’t be able to reach the door handles or open them quickly. This way, you can easily conceal all of the dirty boots and shoes in one place. 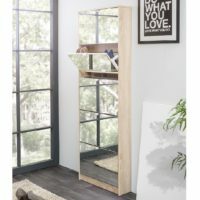 You can get shoe storage cabinets in different sorts of wood like oak, walnut as well as other materials to blend in with your modern farmhouse style. These cabinets are ideal for a living room. The cabinet inside has multiple compartments for storing shoes. Shoes can also be sorted according to their function, e.g. evening shoes, sketchers, sneakers, boots and pumps. 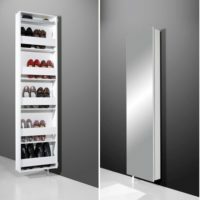 Once the cabinet is closed, you have a large mirror to check out your outfit from top to bottom before you leave the house. Everyone would want to use the mirror to fix their hair or makeup without realising that it is actually a storage compartment for shoes. The shoe storage cabinet comes with brackets for attaching it to a wall. 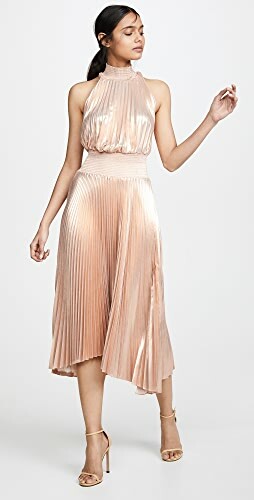 Filed Under: Home Decor, Home Life, Shoes Shoes Shoes! 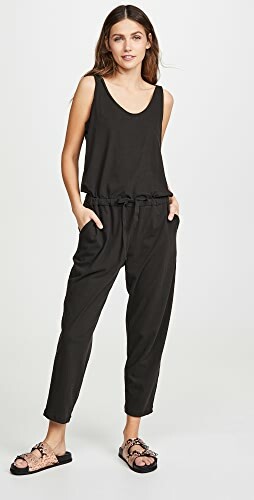 Shop Blouses On Sale, Pink Bikinis, Black Leggings, Saddle Bags and more. Get this widget.